I learned from my colleague that Lam’s Signatures had very humble beginnings. Lam’s Abalone Noodles was opened by a man called Ah Lam in the 1950’s selling mini wok noodles with various other zi char dishes in a small coffee shop. Over the years, it has grown in popularity and now has three outlets in Singapore. A friend used to drive me into Johor Bahru regularly just for abalone noodles. I wonder how does Lam’s Abalone Noodles compare to the authentic abalone noodles in Johor Bahru? Well, let’s find out! 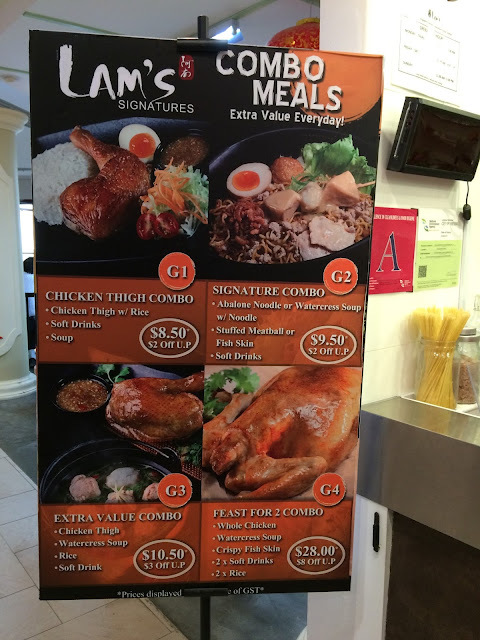 They have Combo Meals which I think are rather value-for-money. I ordered Combo Meal G2 which consists of Abalone Noodle, Stuffed Meatball and a soft drink. I personally feel that the best part of the Abalone Noodles is actually the soft boiled egg. It reminds me of the Japanese favored egg with a delicious runny centre. The noodles are springy and full of bite and tastes pretty nice when mixed with the special sauce at the bottom. There are also three miserable pieces of abalone on a stick which are obviously from canned abalone. Stuffed Meatballs are tender and chewy. 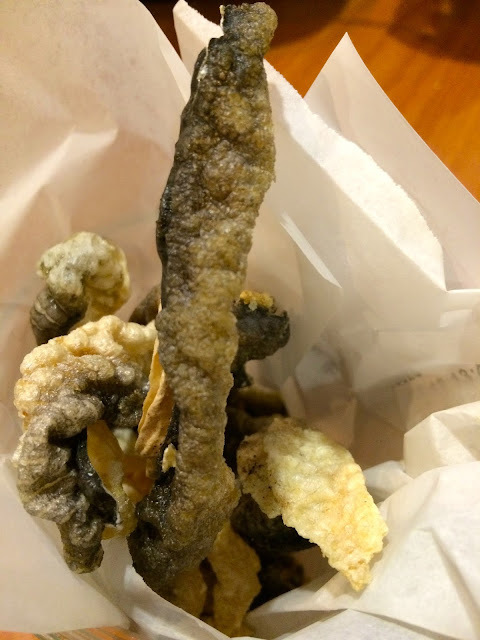 Fish Skin has lost some of its crunchiness from being left in the open for too long and it is not fragrant enough. I miss Tim Ho Wan‘s Garlic Fried Fish Skin. 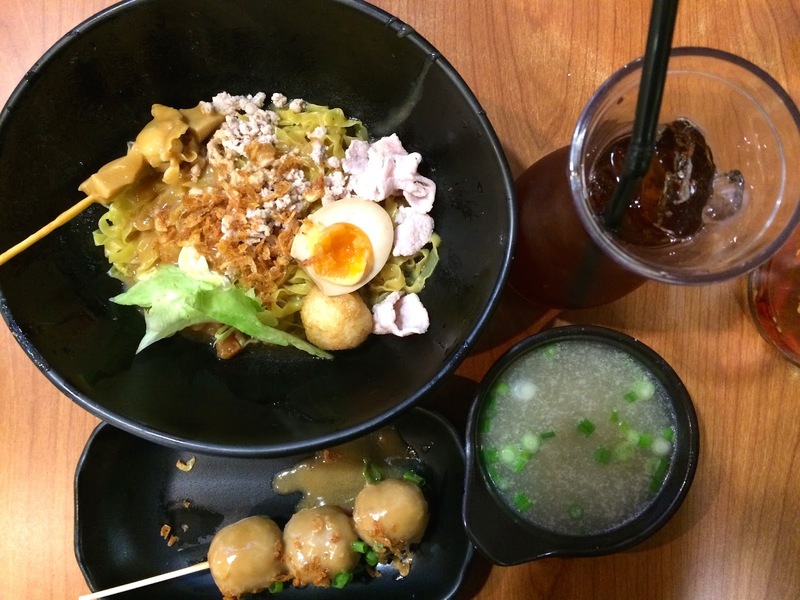 There is no need to compare Lam’s Abalone Noodle and Johor Bahru’s abalone noodles because they are simply two different things. Lam’s Abalone Noodle is really fishball noodles trying to be abalone noodle and failing miserably. The real abalone noodle in Johor Bahru boasts a hearty broth filled with many kind of seafoods and huge pieces of abalone. Now, THAT is a real treat.